Many women like delicate and feminine V-shaped eye makeup. It is ideal for round or close-set eyes because it visually extends them, making their form perfect and giving them a fascinating, incredible bend. The V-shaped eye makeup is typically worn in the evening, during the holidays, and in daily makeup. It all depends on the choice of a palette of eye shadows and your own imagination. What is the V-shaped eye makeup technique? ★ First, apply the lightest shade to the inner corner of the eyes. ★ Next, add eye shadows of medium tone to the middle of your eyelid, and then apply the darkest shade on the outer corner of the eye. Gently shade them towards the temples. ★ Now the fun begins. The darkest color should be applied to the upper and lower eyelids in such a way to get the letter «V» overturned on its side, resembling a tick. 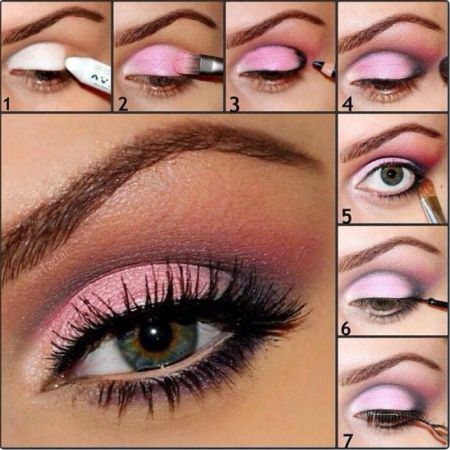 The V-shaped eye makeup technique gives you a great chance of being creative. Take pearl eye shadows, add rhinestones, and glittering particles, and you will get a radiant evening makeup look. Select an exotic, contrasting palette and the bold, striking, original image for a merry party is ready. In any case, the V-shaped eye makeup technique transforms any face and makes it almost perfect. Every girl dreams about making her appearance impeccable. What is V-Shaped Eye Makeup Technique? With the V-shaped eye makeup, you will always be irresistible. And not without reason, this technique is ever so popular and one of the most prevalent trends in modern makeup. There is something to think about when combining different shades. If you are not so confident in your skills, or if you just want to keep abreast of the latest trends, to learn something new, examine the stylists' advice carefully, look at photos, and watch tutorials. In fact, creating this makeup look is not so difficult. After acquiring some experience, you'll be happy to use this technique and will never abandon it. A lot depends on eye shadows and their quality. Remember the saying "cheapest is the dearest" and choose only high-quality makeup products of well-known proven brands. Check the expiration date of your makeup products and promptly throw away old products because they affect the appearance and the health of one’s skin. We wish you success in mastering the V-shaped eye makeup technique! Like the article «V-Shaped Eye Makeup Technique»? Share it with friends!